11th July 1914 King George V Lays Foundation Stone, Municipal Buildings. 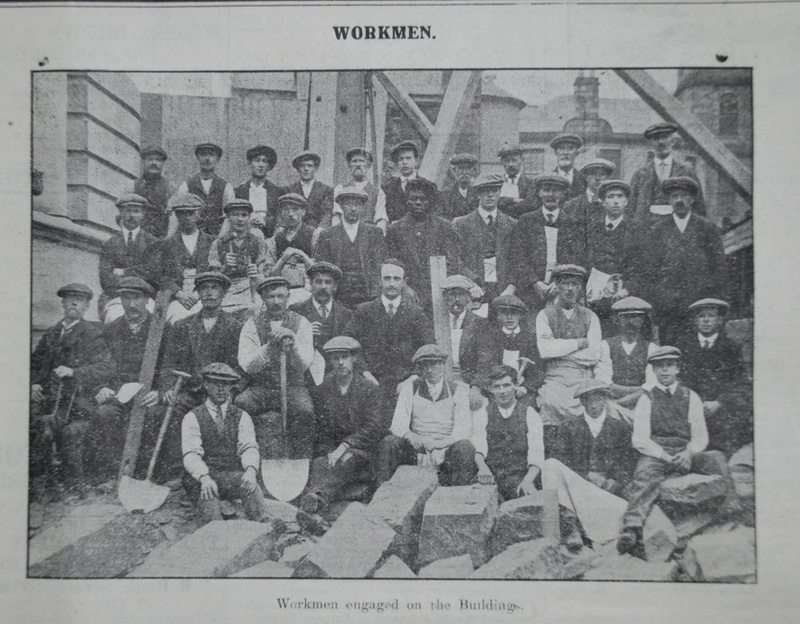 July sees the 100th anniversary of the laying of the foundation stone of Stirling’s ‘B’ listed Municipal Buildings, Corn Exchange Road. The foundation stone was laid on Saturday 11th July 1914 by King George V during a royal tour of central and eastern Scotland. The opening ceremony centred around the laying of the foundation stone by King George V. The foundation stone contained a capsule in the form of a lead casket which contained a bound volume of charters relating to the Royal Burgh 1124-1705, copies of local and national newspapers 30 June – 11 July 1914, a copy of Stirling Post Office Directory 1914-1915, a Stirling Journal Souvenir Programme of the Royal Visit for 11 July 1914, Stirling Observer and Sentinel souvenirs relating to the new Municipal buildings, a complete set of coins of the realm in a glass jar and lastly, photographs of members of the town council of Stirling. There was a ceremony earlier in the day before the arrival of the royal party to fill the casket, seal it and place it in the stone which would be laid by the King. The royal party arrived at 12.35pm, heralded by a salute from the battery at the castle, and accompanied by the Duke of Montrose. They were met by Provost Bayne and J M Lees KC Sheriff of Stirling in front of enthusiastic crowds. 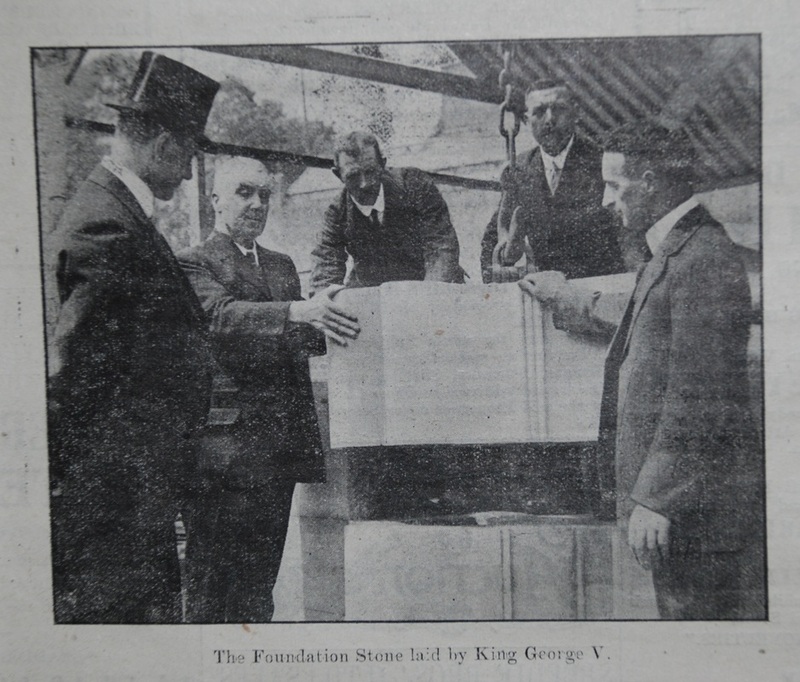 The laying of the foundation stone itself was a grand event with George V pressing a wooden handled lever which was in fact an electric switch (and innovative for its day) which set in motion machinery that lowered the stone into place. The handle of the lever used by the King was made of oak taken from the West Church (Holy Rude) Stirling, and supposed to be 600 years old, with its design also by Mr Gillespie, Architect ‘with a silver band embodying details of the seal of the burgh’. After the foundation stone was lowered into place the royal party drove off by motor car to partake of luncheon with the Duke of Montrose and other invited guests at the castle before departing for Falkirk via St Ninians. Pictures below courtesy of Stirling Council Archives.